Learning how to grout wall tiles well is an on the job task for the dedicated do-it-yourselfer. The good news is that once wall tiles are up and secure, grouting is one of the last jobs you'll perform before your piece of work is complete. The challenge is to learn how to lay grout evenly into all the joints. This will take some practice, but it's worth the time and effort. Grout is the material that occupies the space between tiles. It can be made of a number of different materials, like cement, epoxy, or latex, depending on the application. Tiles that are more water absorbent need a grout with water retentive properties in order to set properly, and tiles that will be used in moist environments, like showers, need to have a grout that has moisture repellent properties, like latex or a latex and Portland cement blend. The tiles you're installing and your intended application will provide the information you need to make the right grout choice. Before you begin the project, read all grout and tile instructions carefully. Some grout materials should be kept at the temperature of the room in which they will be installed, while others may need special tools or preparation. The smartest thing you can do to make your grout install easy and successful is to read all manufacturers' materials before you begin work. Adding tile to your home will help increase its value, but only if the installation looks good and wears well. Once the tiles have adhered to your vertical surface and cured in place, it's time to grout, right? Well, not so fast. First, you should check to see that the tile joints are free of adhesive. Inspect the joints carefully and use a razor scraper to remove extra adhesive or thin set. The smoother the joints are now, the easier it will be to create nice grout lines later. Laying grout is one area where some prior experience is really helpful. Like some painting jobs, there's nothing like experience to help create a professional look. The secret to laying grout is in applying even strokes that distribute grout to all of the joints without voids or dips. If you've never done this type of job before, it can be challenging to apply the grout evenly and work quickly. To get around the learning curve without too many problems, start on a small area that you can control easily. Try a spot about two feet square, and begin in an out of the way spot. Once you get more comfortable with the process, you can tackle more visible areas. Grout is applied with a tool called a grout float that has a rubber face designed to help you smooth the grout in place. 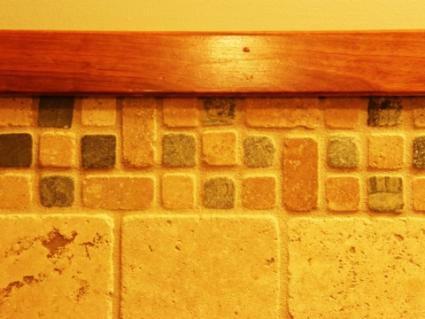 When using a grout float, hold it at a 45-degree angle and sweep it in a diagonal motion across the face of the tiles. This will allow you to fill the joints and remove excess grout at the same time. Tipping or angling the grout float will help you avoid accidentally dipping into joints and gouging out bits of wet grout. Once you've completed a small area, use a damp sponge to wipe the tiles clean. Don't use too much pressure when sponging off tiles. You want to remove the excess grout and clean the tile while still leaving a smooth grout line in the joints. After a few tries, you'll know how to grout wall tiles like a pro and be ready to tackle another tile project.